(Beyond Pesticides, April 20, 2018) There is an extraordinary attack on local community rights to protect people and the environment from pesticides in the Republican Farm Bill, passed by the Agriculture Committee in the U.S. House of Representatives on April 18 on a straight party line vote. The language inserted in the Farm Bill amends the federal pesticide law with a provision that prohibits local governments from restricting pesticide use on private property within their jurisdictions. Local laws in two states, Maine and Maryland, will be overturned with final passage of this law in the U.S. House and Senate. In those 43 states that forbid local pesticide laws by state law, future reconsideration of this prohibition, pushed by the chemical and pest management industry, will be foreclosed. Local laws protecting the environment and public health have historically emerged out of local governments, with laws related to recycling, smoking, pet waste, building codes, and zoning. The fight to defend the authority of local governments to protect people and the environment has been ongoing for decades, reaching the U.S. Supreme Court in 1991. The Court specifically upheld the authority of local governments to restrict pesticides throughout their jurisdictions under federal pesticide law. In Wisconsin Public Intervenor v. Mortier, the Court ruled that federal pesticide law does not prohibit, or preempt, local jurisdictions from restricting the use of pesticides more stringently than the federal government. According to Mortier, however, states do retain authority to take away local control. In response to the Supreme Court decision, the pesticide lobby immediately formed a coalition, called the Coalition for Sensible Pesticide Policy, and developed boilerplate legislative language that restricts local municipalities from passing ordinances on the use of pesticides on private property. The Coalition’s lobbyists descended on states across the country, seeking and passing, in most cases, preemption legislation that was often identical to the Coalition’s wording. Since the passage of those state laws, there have been numerous efforts to preempt local authority in states that do not prohibit local action on pesticides, most recently in Maine. An industry-backed attempt to enact pesticide preemption in the state of Maine failed after bill LD 1853 was voted down in March. The bill resembled a similar bill that failed in the same legislative committee in 2017. Similarly, in Maryland, the chemical industry was unsuccessful in its attempts in the mid-1990s to pass legislation seeking explicit preemption in Maryland. 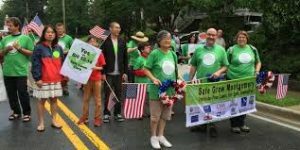 With an ever increasing number of communities stepping up to protect their residents and unique local environment from pesticide poisoning and contamination, the repeated introduction of preemption legislation means that health advocates and forward-thinking communities must continue to remain vigilant, and ready to fight to maintain their right to home rule. Having failed to curtail local action and the growing number of communities deciding to act, the chemical industry is flexing its muscle with a sneak attack in a Congress friendly to its position. Contact your member of Congress, and let them know that legislation that takes away local authority to restrict pesticides throughout local jurisdictions is undemocratic and dangerous to the protection of people and the environment. Tell your elected officials (see suggested language below) that Subtitle B, Section (b) Uniform Regulation of Pesticides, (3) Condition on More Restrictive Regulation must be removed from the 2018 Farm Bill, H.R. 2. To find links, go to the contact pages for your U.S. Representative, click here, and for your U.S. Senators, click here. Language in the Farm Bill amends federal pesticide law to prohibit local governments from restricting pesticide use on private property within their jurisdictions. However, the rights of local governmental jurisdictions under existing pesticide law, the Federal Insecticide, Fungicide and Rodenticide Act (FIFRA), has been left to the states since the law’s adoption. In fact, local laws protecting the environment and public health have historically emerged out of local governments, with laws related to recycling, smoking, pet waste, building codes, and zoning. The rights of local governments to protect people and the environment was upheld by the U.S. Supreme Court in 1991. The Court specifically upheld the authority of local governments to restrict pesticides throughout their jurisdictions under federal pesticide law. In Wisconsin Public Intervenor v. Mortier, the Court ruled that FIFRA does not prohibit, or preempt, local jurisdictions from restricting the use of pesticides more stringently than the federal government. According to Mortier, however, states may restrict local control as a matter of state authority. Please let me know your position on this provision, destructive to the democratic decision making process that protects health and the environment. Subtitle B—Regulatory Reform PART I—STATE LEAD AGENCIES UNDER FEDERAL INSECTICIDE, FUNGICIDE, AND RODENTICIDE ACT SEC. 9101. RECOGNITION AND ROLE OF STATE LEAD AGENCIES. (2) AUTHORITY TO ESTABLISH AND MAINTAINUNIFORM REGULATIONS.—Section 23(a)(1) of the Federal Insecticide, Fungicide, and Rodenticide Act (7 U.S.C. 136u(a)(1)) is amended by inserting after ‘‘enforcement of this Act,’’ the following: ‘‘to authorize the State or Indian tribe to establish and maintain uniform regulation of pesticides within the State or for the Indian tribe,’’. This entry was posted on Friday, April 20th, 2018 at 1:22 am	and is filed under Preemption, Uncategorized. You can follow any responses to this entry through the RSS 2.0 feed. You can skip to the end and leave a response. Pinging is currently not allowed.